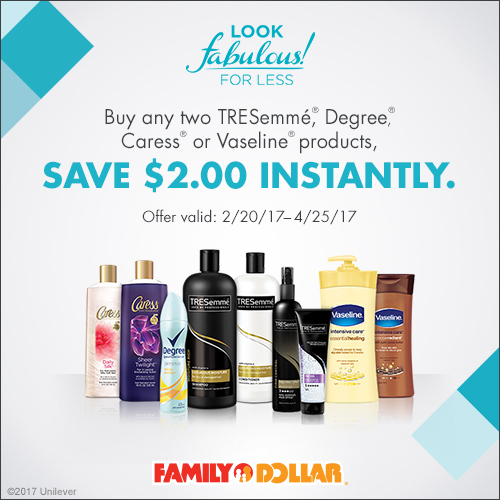 Look Fabulous For Less w/ Family Dollar! Out with the old in with the new! What better way to reward yourself for those long hours of spring cleaning than to rack up on some new beauty and fashion items? Luckily, with the help of Family Dollar, you can always look fabulous for less! I always have the urge to switch up my look for spring, but usually I just don’t know where to begin. If you’re like me and need a little inspiration for your spring style, Family Dollar has us covered! Check out their new Look Fabulous for Less quiz where you’ll answer a few quick questions about your ideal look and then receive suggested head-to-toe styling based on your choices. I got “Beautifully Breezy”! I love the geometric print jumper they suggested. Jumpers will definitely be a go to for me this spring because they’re so easy to throw on and go. The TRESemmé hair products and Caress body wash also sound perfect for this season! Who wouldn’t love getting all of their spring style finds in one place? Be sure to take the quiz yourself and at the end you’ll even receive a coupon so that you can save instantly! Leave a comment wit your results from the quiz for a chance to win a $10 gift card to Family Dollar! Which items will get you ready for your new spring look with #SpringintoFamilyDollar? I have to admit that I put a lot of your bath products from the dollar store - including shampoo and conditioner. It all works the same and it smells great too. I love shopping at the dollar store.